So then, it happened. 77 years, and Britain finally produced a player to win the Wimbledon singles title… 77 years, assuming that only the men’s singles title counts. Nothing unites the British newspapers like a domestic sporting success, as the front pages devoted their coverage to Andy Murray’s historic success at SW19. This may seem relatively inconsequential. After all, it’s their job to report the news. 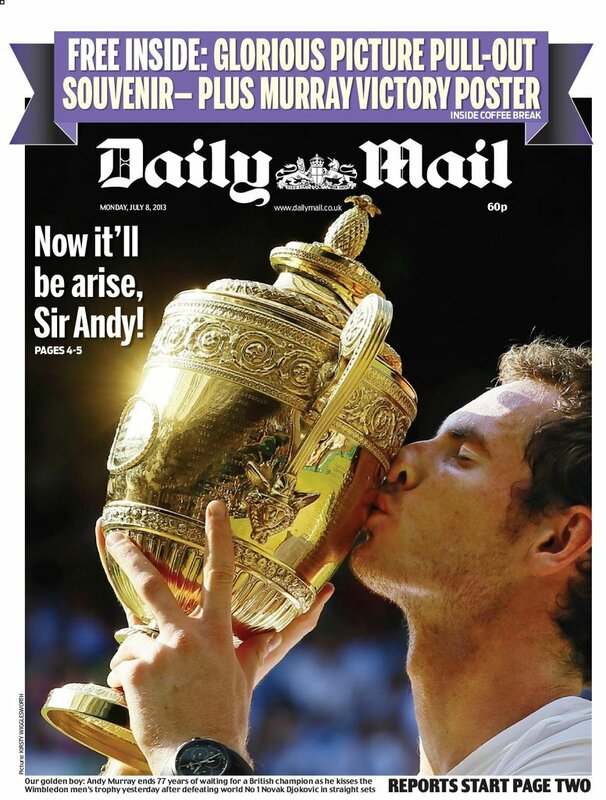 And Murray winning Wimbledon is not only a big news story, but a story that people want to see. Well, not only would such a mindset overlook just how media can shape the national conversation, but also ignores that the idea of Andy Murray being celebrated by large swathes of the British public would have seemed absurd a few years ago. Because Murray’s quest to Wimbledon singles glory wasn’t only an individual journey, but a mediation in his relationship with the English public. I’ve written before about the odd thing that happens to Britain during the fortnight of Wimbledon. I’ve long maintained that we’re a country that doesn’t particularly care for tennis, but we care immensely for what tennis represents. I’d expect the bulk of the response would invoke strawberries and cream, all white clothing, the Royal box, celebrities in the crowd (dressed in their finery), or Henman Hill. Well, I’d love to know what exactly about these things helped Andy Murray beat Novak Djokovic? Or is the truth that these accoutrements frame Wimbledon as a haven for the middle and upper classes of England, in a sport that remains a preserve for the wealthy? And the fact remains, most of the nation’s wealthy are white people. While the All England Club doesn’t have any restrictions on people of colour – bar the economic ones – what does a picture like this do to young children who have a fondness for tennis? Forget “Where’s Wally”, try playing “spot the person of colour in the crowd”? Murray himself famously struggled to win the affections of middle England, which many ascribe to him making a tongue-in-cheek about the England football team. But I view this as a symptom rather than the cause of the apparent dislike, that goes further than a Scottish person having the ostensible temerity to say that he wouldn’t be supporting England at the World Cup. Because Murray’s persona was a surly, scruffy-haired, dour Scot, with a voice so monotone, it made HAL 3000 sound excitable. Not withstanding the fact that Murray recently admitted that his interviews are pure self-preservation, Murray’s relationship with the public was laced with issues of class, nationality, and respectability politics. Simply put, Andy Murray was everything that Tim Henman was not. Murray’s nationality has often been used as a stick to beat him with. I wonder how much of the uneasiness towards him derives from the insulting (and incorrect) maxim that all Scottish people are obese, and are heart-attacks awaiting to happen. A successful Scottish athlete shows the lie to the fat-shaming that Scotland is often on the receiving end of. When Alex Salmond waved a Scottish flag as Centre Court celebrated Murray’s win, it was derided as a crass publicity stunt, trying to politicise a sporting event. ** Of course, waving Union flags at Wimbledon is fine. But a Saltire? Well, that’s just beyond the pale. It would have been interesting to have seen if Henman and Murray had both been at their peak in the same era. Not to see who would have been the better player, but because the relationship between Murray and the Wimbledon crowd felt like a marriage of convenience at times. Those who wanted to see a British victor had no choice but to support him, and only because there was no viable alternative. So while I’m glad to see Murray in good graces with middle England now, I wish he didn’t need to have done so much in order to become one of us. The narrative of Murray being some England-hating crusader; Rob Roy with a tennis racket, was asinine in the extreme. He has never been anti-English (he met with the Prime Minister two days after winning Wimbledon), but he’s rightly proud of being from Scotland. He should never have had to put up with juvenile and xenophobic jokes about him being “British if he wins, Scottish if he loses”. Andy Murray isn’t Tim Henman. He isn’t Fred Perry. The very fact that he comes from a place where tennis opportunities are limited proves it. So now that he’s finally been welcomed by the English public, I hope he doesn’t feel the need to play up to an image to which he’s not suited. Initial reports stating that he will miss December’s Sports Personality of the Year awards is a positive sign in this regard. You may have been able to tell from the tenor of this piece that I’ve always been an Andy Murray fan, and his behaviour not always pleasing the establishment is a factor in this. I’ve liked that he has never seemed desperate to be loved by middle England, focusing instead of being a winner. So well done, Andy. 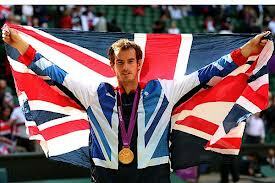 Well done on your Wimbledon win, and well done on your Olympic gold medal, and US Open win from last year. Now please don’t change. * – To be clear, I’m not trying to throw shade at Henman. I cheered him back when he was playing, and despite his privilege, he also worked damn hard at his career, a career of which he can be proud. ** – Funny how politicising sporting events is unacceptable when the politics go against the establishment. Maybe David Cameron will be just as annoyed by the constant use of the Armed Forces at England rugby union matches.